One of the most famous internet cats of all time, Grumpy Cat makes her feature film debut in Grumpy Cat’s Worst Christmas Ever, arriving on DVD December 16 from Lionsgate Home Entertainment. Appearing on the scene in 2012, Grumpy Cat (real name Tardar Sauce) was named the “Most Influential Cat of 2012” by MSNBC and the “Most Important Meme of 2012” by Mashable. Since then, Grumpy Cat has become a household name with its nearly 7 million likes on Facebook, over 28 million video views on its official YouTube Channel and merchandising/endorsement deals around the country. Written and directed by Tim Hill (Alvin and the Chipmunks), Grumpy Cat’s Worst Christmas Ever stars Aubrey Plaza (TV’s “Parks and Recreation”) as the voice of Grumpy Cat. 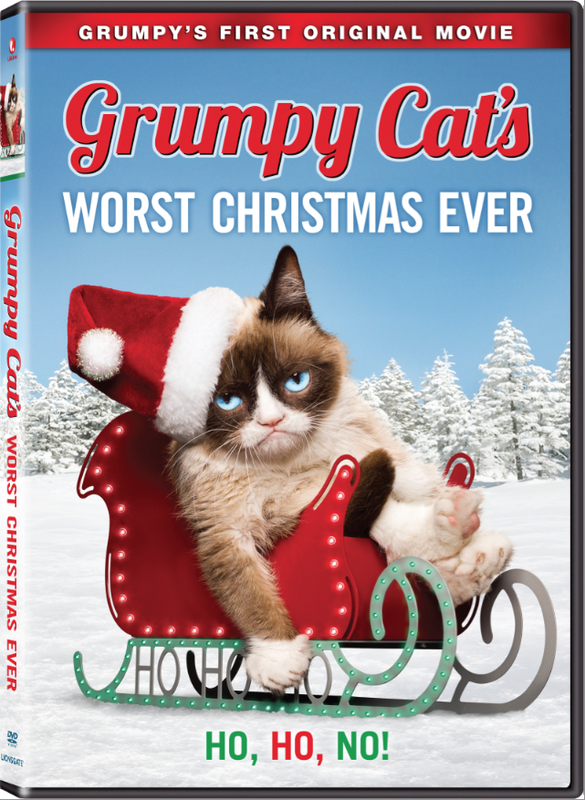 The Grumpy Cat’s Worst Christmas Ever DVD features special bonus material* and will be available for the suggested retail price of $14.98. In this feline sensation’s first movie, Grumpy Cat’s Worst Christmas Ever, lonely Grumpy Cat lives in a mall pet shop where she never gets chosen by customers. Because she always gets passed over, this kitty develops a very sour outlook on life until…one day during the holidays, a very special 12-year-old girl named Chrystal enters the pet store and falls in love with Grumpy. The two form a special friendship when Chrystal discovers she is the only person who can hear this feline talk. Will Grumpy Cat finally learn the true meaning of Christmas, or will it be, in Grumpy’s words, the “Worst. Christmas. Ever.”? Title Copyright:Grumpy Cat’s Worst Christmas Ever, Cover Art and Design © 2014 A&E Television Networks, LLC. All Rights Reserved. Grumpy Cat® and image of Grumpy Cat® are registered trademarks of Grumpy Cat Limited. All Rights Reserved. Lifetime and the Lifetime design logo are trademarks of Lifetime Entertainment Services, LLC, a wholly-owned division of A&E Television Networks, LLC. A+E Networks is a trademark of A&E Television Networks, LLC. Distributed by LIONSGATE® under license from A+E Networks Consumer Products™.